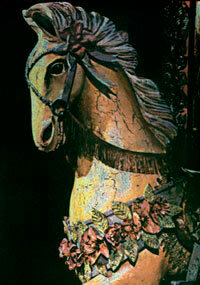 Carousel horses invoke memories of childhood dreams, fun and laughter. As the light fades from the fairground these painted creatures take you to another time and place. Glimpses of colour and shapes emerge from the night providing a sense of a mystery and romance. Ellie Young exhibits locally, nationally and internationally with work in private and public collections around the world. Gum Bichromate process allows colour printing from black & white contact negatives in numerous colours allowing a high degree of artistic control in this beautiful print making process. Colour layers are built up by repeated coatings using pin registration. In 1839 Mungo Ponton discovered light sensitivity of dichromates. John Pouncy used colored pigment with gum Arabic to create the first color images in 1858.